Home / Posts Tagged "northern ireland"
Whilst the vast proportion of the civilian deaths attributable to the Second World War in Northern Ireland occurred during the German Air Raids on Belfast, Newtownards and Londonderry in April/May 1941, there are other deaths recorded on the Civilian War Dead section of the Commonwealth War Graves Commission (CWGC) database, which lists 906 civilian fatalities. The first fatality on the CWGC list is Special Constable William Mould (Local Defence Volunteer, forerunner of the Ulster Home Guard) of Dunmurry who died at 4:30am on 8th September 1940 when he was struck by a vehicle with no lights when walking home whilst on duty. 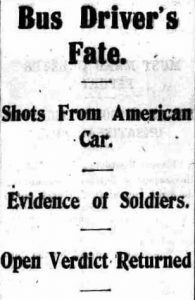 The car was driven by Lieutenant Ernest John Bloom, Corps of Royal Signals and reports on the inquest were carried by the Lisburn Standard and Lisburn Herald (on 13th and 14th September respectively). William Moulds had served with the Canadian Infantry during the Great War and is commemorated on the War Memorial in Derriaghy Church of Ireland. To date I have been unable to locate the burial location. Several people, mainly teenaged boys, died when they picked up explosive devices but there were also tragedies involving the sea and gas leaks … and a few deaths involving British and American military personnel. 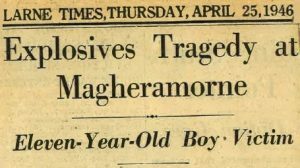 Thomas Barr Murray of Magheramorne in County Antrim was out playing with some friends in a disused quarry on his eleventh birthday on 17th April 1946. The quarry had been used by a rifle range during the war and Tommy picked up an object, which turned out to be a No 68 Anti-Tank Grenade, and he was hitting in with a stone when it exploded, killing him instantly and badly wounding his best friend, John McBroom. The Larne Times (25th March 1946) reported on the inquest and Tommy was laid to rest in St John’s Church of Ireland Graveyard in Glynn. Tragedy struck Cookstown on Sunday 14th February 1943. Whilst playing in Killymoon Demesne, some local lads discovered an anti-tank grenade which they took to two soldiers, who declared that it was safe. Daniel Donnelly (13) grabbed the grenade from John Woods and ran off with his friend, John Creggan (11), and the grenade exploded a short while later. The two boys were transported to the County Hospital in Omagh, but Daniel died en-route at Mountfield and John died of his injuries in hospital. On Tuesday 16th February, a Solemn Requiem was said by the local parish priest Father Teggart CC and the boys were buried in the Derryloran Chapel Hill Roman Catholic Graveyard in Cookstown. Whilst Daniel’s name is recorded on the CWGC Civilian War Dead list, John’s name is not … one of several anomalies that I have detected. 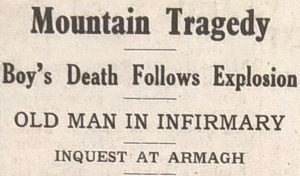 The inquest was reported in the Mid Ulster Mail on 20th February 1943. The inquest into the circumstances of the death on 14th November 1945 of Thomas Molloy (16) of Terla, Tassagh, at the military range on Corran Mountain took place on 23rd November and was reported in the Armagh Guardian on 30th November 1945. According to Mrs Jane Cassells of Corran, the lad was driving a herd of cattle towards the Clady. Mr Murphy, the owner of the field, expressed the view that the cattle might have detonated an explosive device. The story of a distressing tragedy was unfurled at an Inquest in Limavady under Dr John Acheson, Deputy Coroner. Albert Rodden (28), a driver with the Northern Ireland Road Transport Board was killed by a short burst of machine gun fire on the evening of 17th April 1942 on the Dungiven-Limavady Road. Rodden, accompanied by Frederick McMichael, was returning the bus to the depot in Ballyclare. In giving evidence, Frederick McMichael said that Albert had allowed several vehicles to pass the bus in Main Street, Dungiven before pulling out behind them – there was a further, but different car, behind the bus and the driver of the car sounded the horn and tried to overtake. At Farloe Lane, there was a wide place and Albert pulled in to let the car pass and, as the other car came along at a fast rate, McMichael heard a shot and the bus crashed into a wall. Driver De Felice said that when he tried to pass the bus, the car struck the kerb and his passenger, Sergeant Clipsham swayed with the sudden jerk and appeared to be dumbfounded as if he did not know what had happened. In giving evidence, Sergeant Clipsham reported that he was standing in the car and fell against the machine gun, which started to fire. The funeral at Ballykelly Presbyterian Church was a major affair, including representatives from the “B” Constabulary and the Ulster Home Guard, which would imply that he was providing part-time war service, yet his name is not recorded in the Books of Remembrance for civilian fatalities in the Second World War. The inquest was reported in the Derry Standard and the Derry Journal on 20th April 1942 and in the Londonderry Sentinel on 21st April 1942. Joseph Herbert Withers (11) died at the Armagh County Infirmary on 22nd October 1941 following an explosion on Aughnagurgan Mountain – an elderly man, Nathaniel Weir was injured and taken to hospital. William Russell, farmer of Aughnagurgan, said he saw Weir working in a corn field and there was a child carrying corn when he saw a plume of smoke and heard an explosion. Joseph Withers, who was still conscious, said that he got the bomb on the mountain and it exploded when he threw it down. Archibald Withers, the lad’s father was working in a nearby field and heard the explosion. The inquest was reported in the Ulster Gazette & Armagh Standard on 31st October 1941. Robert John Dodds, a 40-year-old farmer from Dysert and a member of the “B” Specials Constabulary since 1921, found a bomb or grenade whilst ploughing a field on Tuesday 26th January 1943 and showed it to his brother, Aaron Dodds. At 8:20 on Wednesday evening, Robert John Dodd left the family home to walk to the “B” Specials Drill Hall – he had the bomb in his coat pocket as he would have to take it to Mr Noble, the Instructor. When he was 50 yards from the house, the bomb exploded and Robert John Dodd was taked to Daisy Hill Hospital in Newry, where he later died. The inquest was reported in the Newry Reporter on 30th January 1943. Frederick Strutt (31), a civilian worker from Dublin was working on the runway lighting at Ballyhalbert Airfield on 4th November 1942 and died when a Beaufort aircraft piloted by Sergeant G.B. Swift of 153 Squadron Royal Air Force ran off the runway and struck him – Frederick Strutt is buried in Deansgrange Cemetery at Drumcondra in Dublin. Seven days later, Sergeant Swift (Aus 406552) and his Crewman Sgt D.J. Blanchard were transferred to 29 Squadron. (Additional information from Andy Greenfield, www.ww2ni.com). The inquest was reported in the Newtownards Chronicle on 14th November 1942. Messrs Redmond, Sons & Company, a manufacturer of packing cases, employed a night-watchman and fire-watchers at its premises on the corner of Connaught Street and Milner Street in the Village district of South Belfast. When William Elliott arrived at the works at 7:30am on the morning of 2nd December 1942, he found the night-watchman, Alexander Watson of Coolderry Street, lying on the floor in front of a gas fire and later found the four fire-watchers in their beds – two men, William Dowling of Donegall Avenue and James Campbell of Norfolk Drive, were already dead and the other two men were taken to the near-by Royal Victoria Hospital. George Leslie of Olympic Drive died in hospital but Henry Kavanagh (18) of Ross Street survived. The gas fire and the radiator in the sleeping quarters had been installed only ten days previously and, whilst William Elliott reported that he had noticed a strong smell of gas, a Corporation expert examined the radiator and reported that it was in perfect order and that there was no sign of an escape of gas. James Campbell (18) was buried in Milltown Roman Catholic Cemetery, William John Dowling (49) was buried in Dundonald Cemetery, George Leslie (37) was buried in Belfast City Cemetery and Alexander Watson (63) was buried in Lurgan Cemetery.